Here’s a tip: If you go to Coney Island, pack a lunch. I mean, it’s not like you’re going for the food when you head to Brooklyn’s trippy amusement park on the beach, amiright? (Hot dog eating contest participants not included.) You’re going to Coney Island for the thrill rides, the very easy games on the midway, and pure weirdness of everything that is Coney Island. It’s fantastic. But it is not so gluten-free. Naturally, I expected this before heading out to the tip of Brooklyn but that did not stop me from trying to hunt down some g-free eats for you people who also love the sun, surf, and loop-de-loops. Here’s what went down. Just like your favorite state fair, everything you eat on Coney Island is fried or wrapped in bread. But if you venture alllll the way to the end of the food booths you will find an actual restaurant, the famed Tom’s Restaurant, actually, at its Coney Island location. After watching the crowd go wild over New York slices, I had to have the pizza burger, sans bun. They did tell me the fries were gluten-free and cooked in their own fryer, but I looked at those bumpy ‘taters and decided to pass. French fries have done me in before, and quite frankly, I’m not going down over fries. So that’s it! That’s what you can have gluten-free while visiting Coney Island. Oh, and booze. But not beer, which is what you’ll find everywhere, again, except for Tom’s Restaurant which has a fully stocked bar and makes a mean gin and tonic. 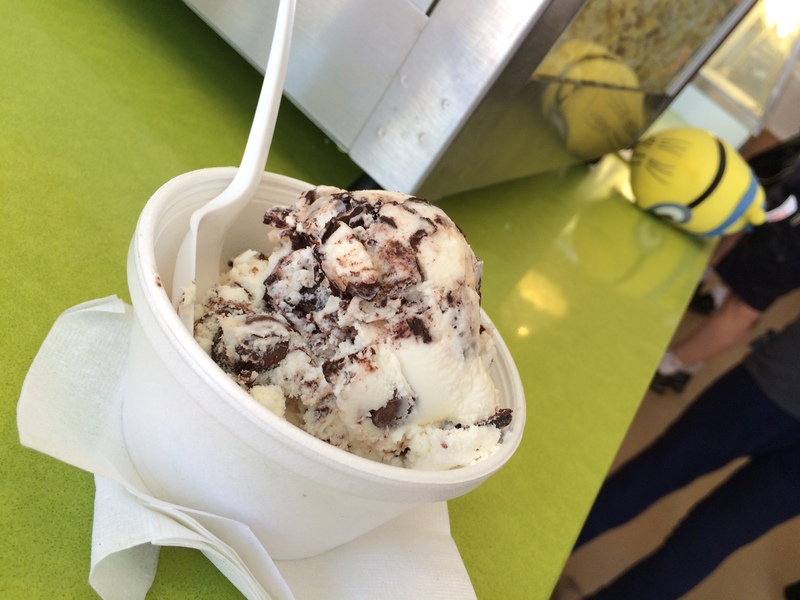 Also, as there is in Paris, on Coney Island, there is always ice cream. 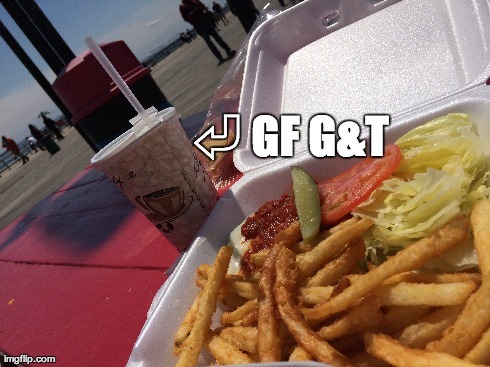 Tags: gluten free dining, gluten free travel, gluten-free coney island, gluten-free new york. Bookmark the permalink. You can eat regular ice cream? I can eat regular ice cream if I haven’t been gluten’d. Milkshakes though, no way Jose. At least, there’s ice cream… I hate it when I go somewhere, and there’s practically nothing to eat. So damn frustrating! April, did you hear about Asian Box in Burbank, where you can eat 100% of the food? I just read about it on the LA version of Eater. They’re a fast-casual Asian restaurant akin to ShopHouse, and they happen to maintain a gluten-free kitchen. Their executive chef is from the Slanted Door, a well respected Vietnamese restaurant in the Bay Area, so I’m hoping Asian Box will be good. I’ve been dying to try it, but I live on the Westside, so it’s hard for me to get to Burbank. Here’s a link to their menu: http://la.eater.com/uploads/Asian%20Box%20_Menu.pdf. OHMG, Yoshiko. I have not heard of that. Thank you soooo much! You’re so welcome, April! Now, I have to find some excuse to get over to Burbank. Wow! I would not have thought. Thanks.